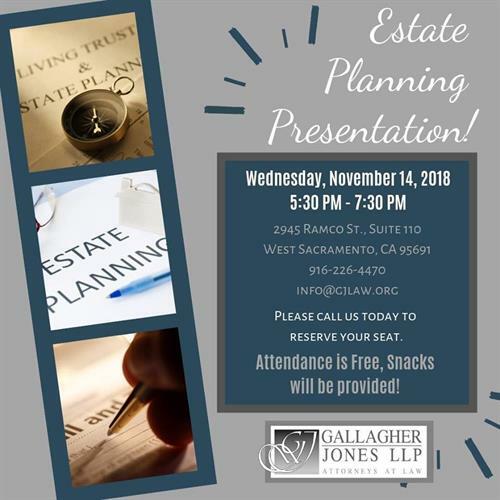 Gallagher Jones LLP Free Estate Planning Presentation! Name: Gallagher Jones LLP Free Estate Planning Presentation! This year will be coming to an end before you know it. It is a perfect time to think about your estate plan and make sure your affairs are in order! Come to our presentation to learn the “Dirty Dozen” Estate Planning Mistakes and how to detect & avoid them. Find out how to protect your investments and legacy while gaining peace of mind with a customized estate plan. This informative presentation is complimentary to the public. Snacks and drinks will also be provided. Please RSVP by November 12, 2018. Space is limited. A discount code will be offered at the end of the presentation, so join us to find out what it is!